Our banana-pudding parfait recipe is, in fact, a cinch to assemble—but unbelievably elegant. 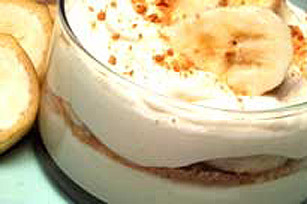 Just layer up vanilla pudding, graham crumbs and sliced bananas and dessert is done in 5 minutes. PREPARE 1 pkg (4 serving size) JELL-O Instant Vanilla Pudding according to package directions, reducing milk to 1 cup. Fold in 1 cup thawed COOL WHIP Whipped Topping. Divide half of the pudding mixture among 4 dessert dishes; topping each with a spoonful of graham cracker crumbs and banana slices. REPEAT layers and chill until ready to serve. To prevent banana slices from turning brown, dip into equal amounts of lemon juice and water.